Kim Malz 9 rounds + 4 pull-up (16lb ball, 1.5pood). The warm up is an integral part of your workout. We have written on the topic many times before and even had a two week intensive focusing on the power of the Classic CF Warm up (CFWU). Depending on the Workout of the Day, we develop a warm up that will both prepare you for the workout and keep you learning new skills. BUT. The warm up we put on the board is not the best possible warm up for you! Each of you have different goals, weaknesses and backgrounds. I make reference to the fact that I want you to individualize the warm up all the time, but I have never outlined what that means and how to actually do that. The warm up is THE best time to work on your weaknesses. The truth about my warm up is that I do almost the same thing every day, plus or minus a few exercises. I rarely, if ever, do the warm up that we write on the board. This is not because its not a good warm up, but because there are other things I want to work on that simultaneously get me warmed up for the workout! I want others to take this aspect of their fitness into their hands and stop going through the motions. The warm up should have a meaning and a purpose. Over the next two weeks, we will be asking you to develop your own warm up! The first question to ask yourself is if you can perform all of these movements. Do you have mobiility issues that prevent you from performing a quality OH Squat? 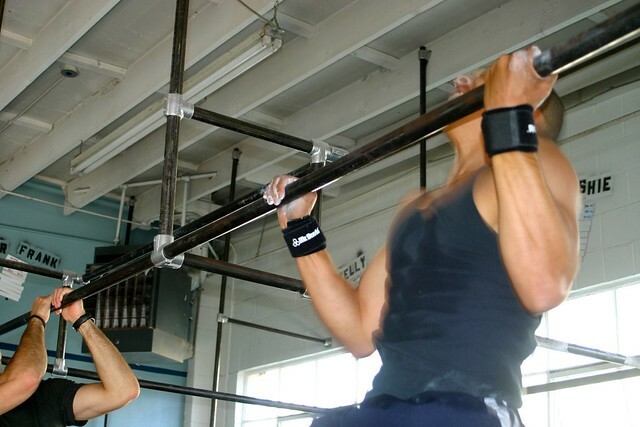 Can you do a strict full range of motion dip and pull up? Throw your ego out the door when analyzing yourself. Be honest. Focus on PERFECT form when performing these movements in your warm up. Many people need to learn how to keep their body rigid, or hollow, while performing the basic gymnastic movements like push ups, pull ups and dips. The progression is always technique and consistency then volume and intensity. This quality work may be slow and frustrating, but it is important! These skills transfer over to everything that we do. If you do not know how to control your body, you will be continually frustrated in the more complex movements. The answer to these issues is consistency! I make the reference regulalry that daily ten minute stretching sessions will affect more change than one long session once a week. For those that have mobility issues, you need to work on it EVERY DAY! If every day is too much for you, then the least you can do is to address it in every warm up session. These limitations are the culmination of years of poor positioning, lack of use or past injuries; they did not occur overnight and will not go away overnight. The main problem areas are the shoulders and hips/low back. My suggestion is to start with the hip prep series’, focusing on which movements are challenging or feel limiting. Also, be sure to peruse the list of stretches in our Cool Down area of the Video Library for movements that you can perform after the workouts or on your rest days. It is easy to get overwhelmed when thinking about everything that you want to get better at in CrossFit. For most people this means some type of strength training, whether it is gymnastic or lifting based, people need to get stronger to be able to perform the movements in the WOD properly. Again, throw the ego out the door! Don’t worry about your time on the WOD if you are doing strength work beforehand. If you are performing 5 sets of strict pull ups in your warm up and then you have to hold a barbell over your head in the workout, your performance might suffer on that given day, but you will be stronger in the long run! I will go over what I do for my warm up tomorrow, but a good idea is to try and find movements that have a great amount of transferability. Take the time to think about the workouts and movements you struggle with and look for a common thread between them. Use that information to guide you in creating your warm up and ultimately accomplishing your goals.